Arrange slides into groups to keep your quiz organized. For example, if your quiz covers several distinct topics, you might split your slides into logical groups. Learners won't see these groups, but you can use groups to shuffle the questions they do see. 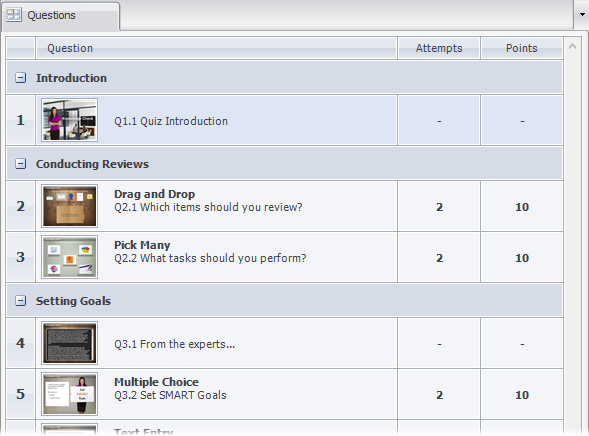 You can also choose to show all the questions in each group or just a subset. In this tutorial, we'll explore how to manage question groups, randomize questions, and choose a sample size for learners. To create a new group, click the Question Group button on the ribbon. A new group divider will be added to the end of your question list. 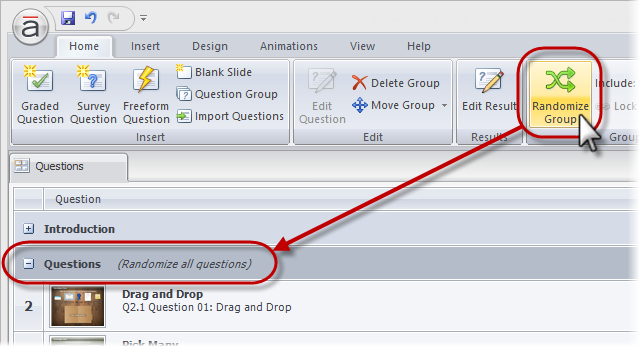 To change the default name for a question group, click its header once to select it. Then click it again to open it for editing. Type a new name, and press the Enter key on your keyboard. To add slides to an empty group, use your mouse to drag existing slides into the group, or create new ones. You can also delete groups and rearrange them. See Managing Slides. Right-click it, scroll to Lock Question, and choose one of the options. 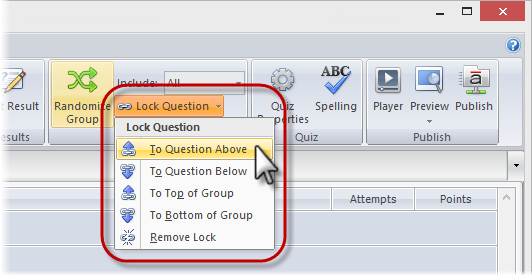 Click the Lock Question drop-down on the ribbon, and choose one of the options. When you randomize a group, all questions in that group get shuffled and displayed to learners. But you can change the number of questions that get displayed. 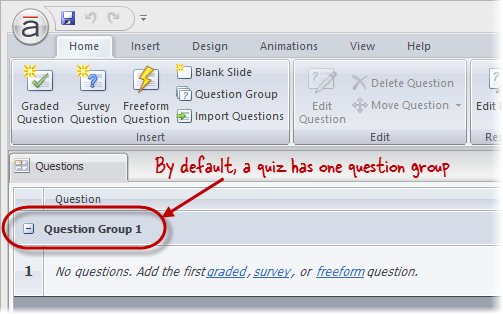 Just click the group header to select it, and use the Include drop-down on the ribbon to choose the number of questions you want to draw from the group. When you choose something other than All, the phrase "Randomize, include # questions" will be added to the group's header (where # represents the number you selected from the Include drop-down).